We’ve been here before: a middle-class dinner party, an argument over something innocuous, secrets revealed. What’s in a Name?, a new adaptation of French duo Matthieu Delaporte and Alexandre De La Patelliere’s feather-light comedy, makes no attempt to play with genre conventions but it still delivers a funny, well-acted roast of the modern bourgeoisie. Couples Peter and Elizabeth, Vincent and Anna, and their friend Carl attend a dinner party at Peter and Elizabeth’s stylish Putney pad. Anna is pregnant and Vincent plays a joke on the rest of the party by pretending that they’ll be naming the new-born Adolphe (with a ph, not an f – the devil really is in the detail). That’s about all there is to it in terms of plot. The performances are very strong. 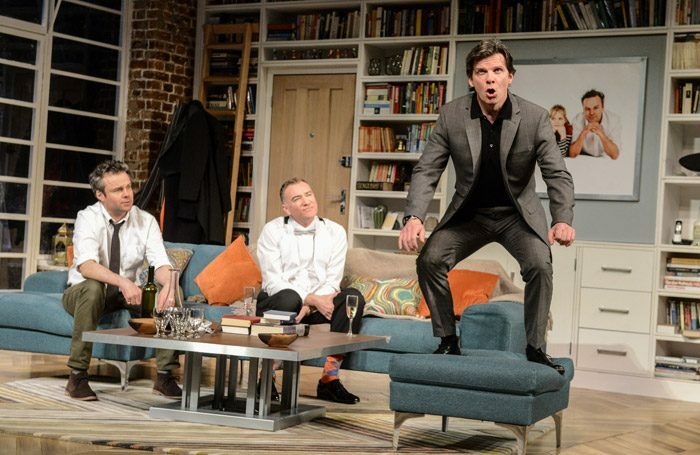 Nigel Harman is gloriously funny as suave estate agent Vincent and Sarah Hadland is similarly impressive as the put-upon Elizabeth. But Olivia Poulet’s Anna has a lot less to do and she puts in a strangely mannered performance. Jeremy Sams’ adaptation is consistently funny. Francis O’Connor’s set is also effective, homely but a little cold. The pacing of Sams’ production drags a little in the final third, and the play contains one too many endings, but it makes for an enjoyable, if insubstantial, affair.